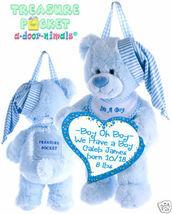 This cute little bear grows with your little boy. 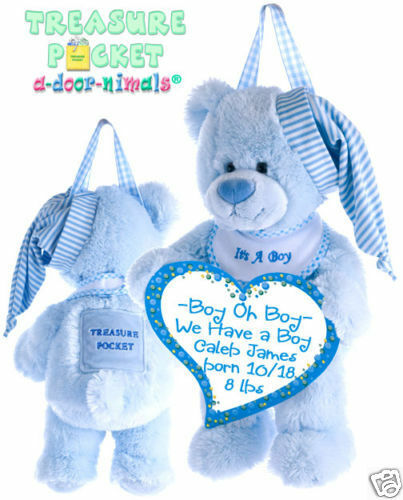 Hang him on the door at the hospital to announce baby's birth - his cute removable bib tells guests "It's A Boy." As your little one grows, your bear's Treasure Pocket is perfect for little "rewards" and he is the cutest Tooth Fairy Bear! The child can write a note to the Tooth Fairy and place his tooth in the Treasure Pocket -- when the Tooth Fairy visits, she can replace the tooth with her little gift and write a note to the child (maybe something like "Don't Be In A Rush...Brush Brush Brush!"). 18" in length a-door-nimals Decorating Ideas FUN Baby Shower Centerpiece Greet Baby Shower guests with an a-door-nimal hung from the door - or decorate the center of a table with a cute a-door-nimal. A message to the expectant mom can be written in permanent ink (and erased with fingernail polish remover). After the shower, the a-door-nimal can be presented to the expectant mom to take home with her. TREASURE POCKET a-door-nimals: Ask guests to write down some "advice" for the new mom and place the cards in the Treasure Pocket for a wonderful baby shower keepsake. Innovative Pregnancy Countdown Expectant Moms can take their a-door-nimals to the office and count down the days 'til baby is due. And, it's a great way for siblings to count down! Mom may use the attached dry-erase marker or any dry erase markers to create her own personalized countdown. Additionally, she may use a permanent marker on the surface of the heart to write everything except the actual "count down days" -- the count down would then be written in dry erase marker to easily subtract a number each day. The permanent marker can then be removed with nail polish remover before taking to the hospital to use as a birth announcement for the hospital door. Here are some sample messages: We're Having A Girl! Courtney Christine is due in 46 Days It's A Boy!! Our Little Pup is due in 46 Days Help Us Countdown... Our Baby Boy is due in 46 Days Unique Birth Announcement for the Hospital Door Mom and Dad can write their personalized birth announcement on the heart surface using the attached dry-erase marker or any dry-erase marker. 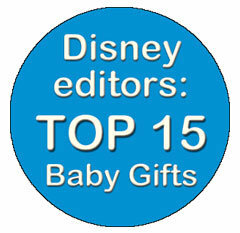 Guests to their hospital room will smile as they are greeted with such a cute and cuddly announcement! Here are some sample messages: It's A BIG Boy!! Paul Robert born 8/22 9 lbs 12 oz 22" Our Tax Deduction is Born! Adam Nathan Jones was born 6/28 wt: 7 lbs 6 oz 21" A little girl...so soft pink was born for us to love! Meet Megan Chloe McGilvray ...a gift from up above. 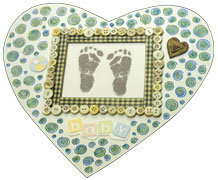 Keepsake for Baby's Footprints Add baby's footprints to the back of the heart for a wonderful Keepsake! While at the hospital Mom can ask her nurses to add her baby's footprints to the back of the heart. Since her nurses become a part of the family, she can also ask them to write a special message to her baby. The heart is acid-free, so when it is no longer used for messages, she can decorate it with scrapbooking embellishments and add it to her baby book. Stylish Decoration Mom and Dad will take their a-door-nimal home to adorn their nursery and write special messages for baby and guests! Their a-door-nimal may be hung on the door to greet visitors or it can be used to decorate a wall in the nursery. Here are some sample messages: Baby Sleeping... You Wake Her You Take Her! Paul Robert birth wt: 9 lbs 12 oz 1 month wt: 10 lbs 14 oz 2 month wt: 12 lbs 6 oz Come In and meet our Little Pup! Caleb James Cuddly Best Friend When their a-door-nimal is no longer used as a decoration, Mom and Dad can cut off the ribbons and tags, remove the heart and marker and give the critter to their child for a Cuddly Best Friend! By TwitterButtons.com DUE TO THE FACT WE HAVE AN ESTABLISHED ONLINE STORE WE HAVE A MERCHANT ACCOUNT AND ARE ABLE TO TAKE CREDIT CARD PAYMENTS WITHOUT GOING THROUGH PAYPAL OR GOOGLE CHECKOUT. IT IS THROUGH AUTHORIZED.NET IT IS SAFE AND SECURE. IF YOU WANT TO PAY THAT WAY JUST EMAIL US WE WILL WORK WITH YOU.